In studies of mouse cells, Johns Hopkins researchers have found that low levels of cellular copper appear to make fat cells fatter by altering how cells process their main metabolic fuels, such as fat and sugar. The discovery, they say, adds to evidence that copper homeostasis could one day be a therapeutic target for metabolic disorders, including obesity. The researchers caution that although links between copper and obesity in humans have been reported, more work needs to be done to better understand the connection. In the western world, dietary copper deficiency is not common, except in pregnancy, and the main health risks are associated with genetic disorders of copper misbalance. A diet incorporating vegetables, nuts, and even chocolate usually contains enough copper to maintain healthy copper levels. Copper is essential to human biology and helps to facilitate many processes, including the formation of pigments in hair and eye color and new blood vessels. The mineral is also important to cognition. Copper imbalances have been associated with several neurological disorders, and altered copper levels were linked to depression and changes in sleep pattern, says Svetlana Lutsenko, a professor of physiology at the Johns Hopkins University School of Medicine and a senior researcher on the study. Copper-deprived cells grew to more than twice the size of their healthy counterparts and contained more fatty molecules, called lipids. 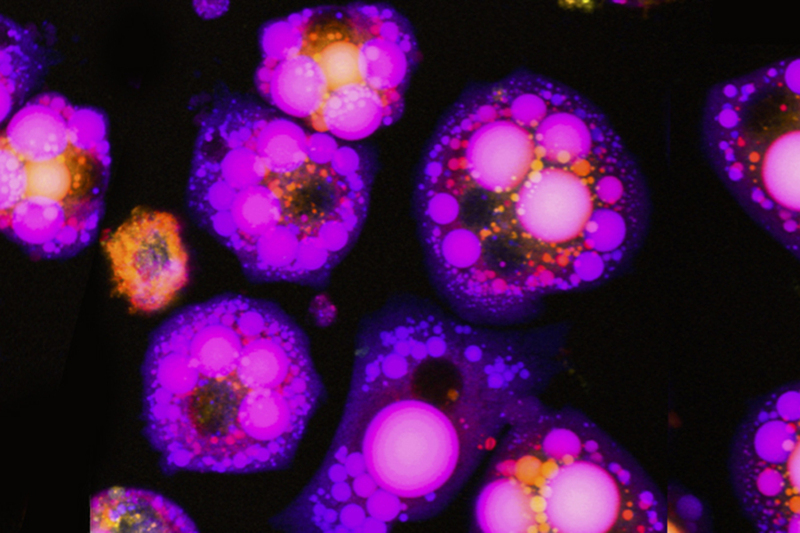 The study, published online in the journal PLOS Biology, summarizes the research team's efforts to describe the role of copper balance in the physiology of fat-storing cells, called adipocytes. Haojun Yang, lead author on the paper and a graduate student in cellular and molecular physiology at the School of Medicine, tackled this question as part of her PhD study. The researchers wanted to understand how adipocytes used copper. They did this by first growing mouse fat cell precursors in the laboratory that could be chemically signaled to grow into mature adipocytes—the kind used to store fuel. The researchers monitored the cells' copper uptake and the proteins they produced during this developmental process. Lutsenko and her team found that during maturation, adipocytes ingested twice the amount of copper as the precursors. They also found that several copper-containing proteins were more abundant, especially an enzyme called semicarbazide-sensitive amine oxidase, or SSAO, which was extraordinarily "upregulated," appearing at levels up to 70 times higher than in the precursor cells. Past studies have shown that SSAO is copper-dependent, and is uniquely abundant in adipose tissue, but it remained unclear how cellular copper levels affect SSAO and how SSAO activity is linked to adipocyte metabolism, Lutsenko says. "We were intrigued to see that these components correlated," Yang says. To test whether the cells' copper consumption affected SSAO's function, Yang limited copper availability during adipocyte maturation. She found that the lack of copper did not keep the cells from developing into mature fat cells, but, unexpectedly, the copper-deprived cells grew to more than twice the size of their healthy counterparts and contained more fatty molecules, called lipids, than did cells developing under copper-adequate conditions. To determine whether loss of the copper-dependent SSAO activity was responsible for the change in size and fat accumulation by the copper-deprived cells, Yang engineered cells that lacked the enzyme entirely using genetic editing and monitored their development. When chemically induced to become mature fat cells, these lab-grown mouse cells looked remarkably similar to cells deprived of copper in the earlier experiments—they grew to about twice the size of normal cells and contained more lipid. This result affirmed that cellular copper levels were essential to SSAO function and that deactivating this enzyme caused fat cells to grow abnormally, the researchers said. The researchers knew from previous studies that SSAO had insulin-like effects, causing the cells to consume more sugars. They hypothesized that hindering the enzyme's function may force the cells to switch fuel sources. To test this hypothesis, the researchers compared the protein profiles of three lines of cells: normal fat cells, cells without SSAO, and cells with SSAO genetically removed and then "rescued" by adding the protein back in. They looked for differences in protein expression and sugar or lipid intake as these cells matured. Yang repeated her earlier experiments with these cells, inducing them to develop into mature fat cells and analyzing their protein composition three, six, and nine days after induction. The researchers report they are now planning studies to monitor SSAO in the bloodstream of humans with fatty liver disease and diabetes, because SSAO appears in elevated levels in the blood of such individuals. "We suspect that SSAO may help regulate fuel selection in other tissues," says Yang. A dietary solution to severe epilepsy?